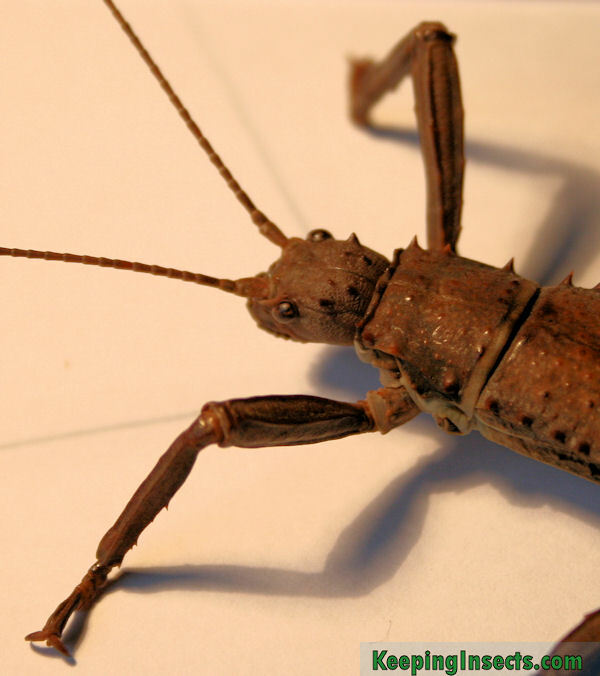 The New Guinea Spiny Stick Insect, or more specifically Eurycantha calcarata, is a large species of ground dwelling stick insect from New Guinea. The Phasmid Study Group give it the species number psg 23. Sometimes it is called Giant Spiny Stick Insect, but this is too confusing as there is also a different species called Giant Prickly Stick Insect. Males can be aggressive towards other males, therefore you need to house them in an enclosure with enough free space. When the males feel threatened disturbed, they will stand on their front legs and lift their hind legs up in the air. The big thorn who is present at the inside of these large legs will be used to defend itself. It will snap its legs towards each other, trapping anything that comes between these legs. It can be very painful when it grabs your hand, so make sure you stay away from the spine on the legs of the male. 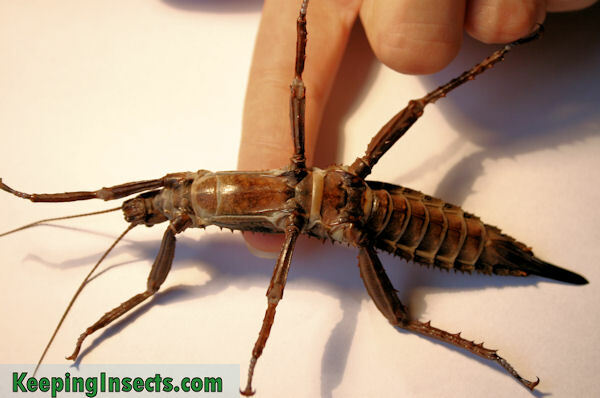 Here I show you the underside of an adult female Eurycantha calcarata to show you the segments of its body and its relative size. The light colored patches are flexible and soft while the brown plates are hard and rigid. Plants from a shop can be sprayed with insecticide, so it is better to get leaves from nature. A temperature of 20 to 25 ° C is sufficient for this stick insect. This species has to be kept moist. We recommend spraying the enclosure about 4 times a week. Make sure there is a lot of potting earth or humus at the bottom of the terrarium. Keep this moist, but do not allow mold to develop. Like all species of stick insects, the terrarium of the New Guinea Spiny Stick Insect should be at least 3 times the length of the insect in height, and at least 2x the length of the insect width. For an adult female this means at least 45 cm in height and 30 cm in width. It is important that each stick insects has enough space, so the more insects the larger the tank should be. This species can sometimes fight with each other (especially males) when they have too little space. This species needs a thick layer of moist earth, sand, vermiculite or potting ground at the bottom of the terrarium. The females lay their eggs in the ground. You also need to offer the animals a place to hide under, like a broken flower pot, a shallow wooden box or a piece or rock that is a bit lifted from the ground. They will crawl under anything that is dark and a bit moist. This species does need branches to hang from when molting, so be sure to supply these too! 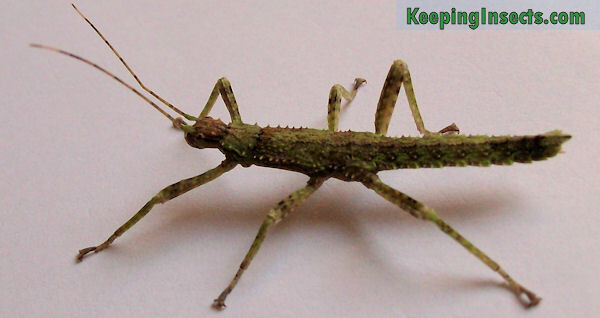 This is a nymph of the New Guinea Spiny Stick Insect. They look very different from the adults. The males of this species are easily recognizable by the big thorn on their hind legs. They are also a bit smaller than the females. The females have an ovipositor on their abdomen, which the males do not have. Eurycantha calcarata males and females can be kept in one enclosure to allow them to mate. You do not need to do anything to ensure this happens. The eggs are small light brown ovals which are deposited in the ground. The ovipositor of the female is used to “drill” a hole in the ground where the egg is laid into. She will then use her ovipositor to bury the egg by sweeping soil over the just drilled hole. The eggs hatch after about 4 to 6 months. The eggs should be kept in moist soil. This should always remain moist but not extremely wet. In a small box, 3 times per week spraying should be sufficient. Eggs which are not fertilized by a male will not hatch.